Up the Creek | What is ML Reading? 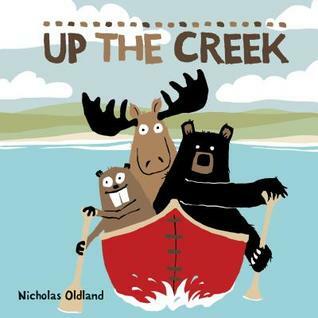 Up the Creek by Nicholas Oldland is not as large as most picture books. It’s only 8.3 x 8.1 inches. What it lacks in size, it makes up in humor. Three friends… a bear, a moose and a beaver rarely agree. When the three friends decide to take a canoe trip, it’s filled with strife. Canoeing in circles, tipping over, splashing each other and lots of yelling. Too busy screaming at each other, they don’t hear the white-water rapids until it’s too late. Oops! In the face of disaster, they work together. Repairing the canoe, fixing the paddles, making lunch, and giving thanks. Our favorite illustration is lunch being cooked over a campfire. Bear is cooking a fish, moose is roasting grass and beaver is heating a twig. There are several other books by Nicholas Oldland featuring bear, moose and beaver. Sadly, our library only owns two. We’ll be requesting Big Bear Hug and Making the Moose Out of Life. This entry was posted in Picture Book and tagged Big Bear Hug, Making the Moose Out of Life, Nicholas Oldland, The Busy Beaver, Up the Creek by mlreads. Bookmark the permalink.